Hanging out in Tampa with family. 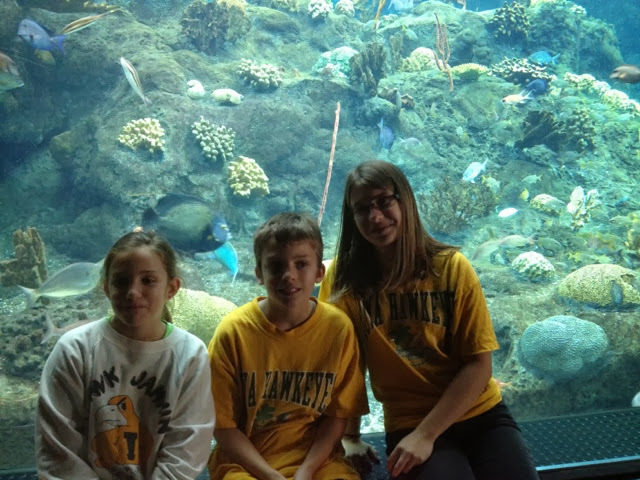 After the aquarium we started a round of bowling. Parade to follow and something with sports at the convention center before the big game tomorrow. Iowa made it to the outback bowl. We came to Tampa for the big game. Kurt's brother and family met us here. 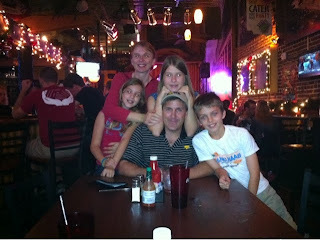 Tonight we walked through downtown Ybor City and had dinner at the Green Iguana. Tomorrow we will visit the aquarium and watch the parade. The game is on Wednesday. 4 rows done on the Midget Quilt. 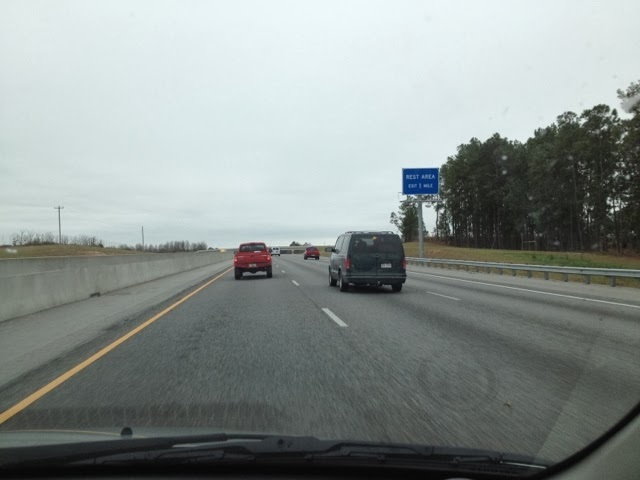 It is slow going for sure. Lots of stitch in the ditch. I'm getting better with each row. It is a rainy dreary day, perfect excuse for time in the sewing room. I've been making nice progress on hand quilting of the little blue Dear Jane. The middle chunk got finished during a Christmas trip to see my sister and her family. I really wasn't a very experienced quilter when I started this one. Going back and looking at some of the workmanship that went into the blocks has been interesting. I spent quite a bit of time right before dinner in the car yesterday tightening up the stitches on an previously hand stitched block. It is much more likely to stay together now I think. Still, each quilt is a snapshot in time of our skills and interests. This one was what I was capable of at the time. I am glad I did it, and it gave me the courage to start again on my Rainbow Scrap Challenge Dear Jane which I think is going to be amazing. 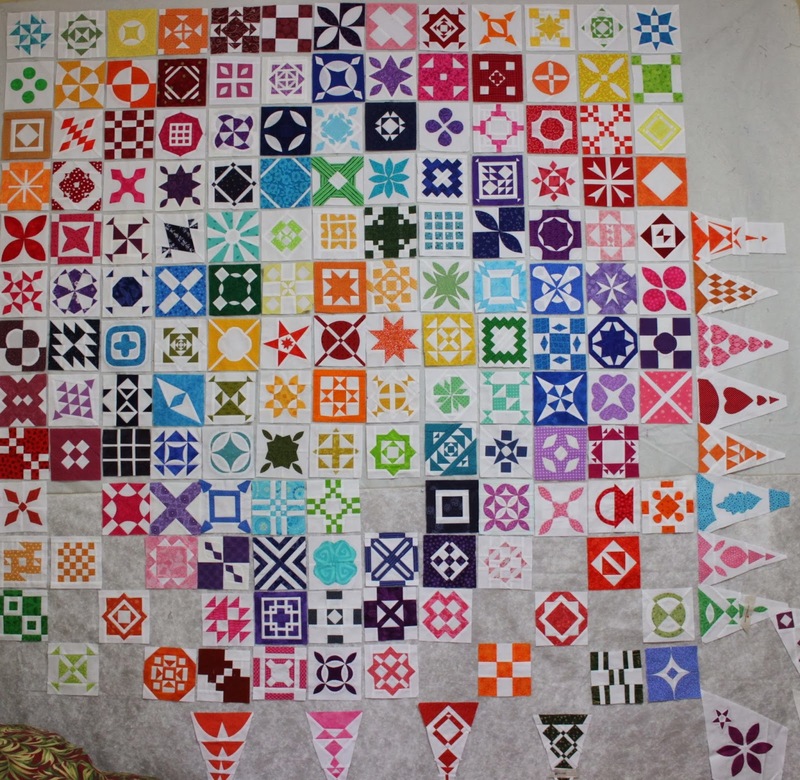 With just 8 blocks left to hand quilt, I have started to ponder the border. 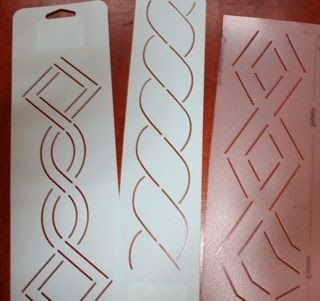 Originally I had pictured a cable border, like the one in the middle, but when I went to grab it out of the stencil drawer, I also found a cable diamond combination that was nice as well as a diamond. Plenty of time to think it over as I finish off the last few blocks. I hope you are finding a few minutes during this busy holiday season to settle in with a bit of hand stitching. 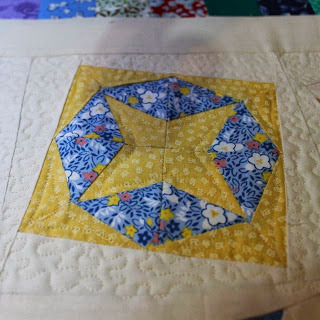 Join up with the ladies over at Kathy's Quilts to see how others are spending some time on this quiet Sunday. Not my most productive quilting year ever, at least in terms of finished quilts. There has been a lot going on though. We all do the best we can, right? 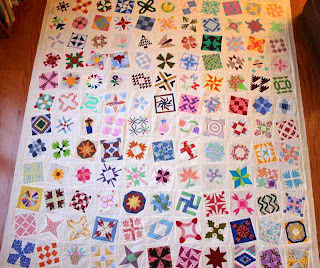 The orphan block quilt was for quilting practice. Shoot for the moon was for Anna. The pink chemo quilt was for Mom. I couldn't find a picture of it finished, but it was with Mom when she passed away in July. And this one was a gift for my friend Meisje who was very sick last year. It is called Sand and Sea. I'm sure somewhere there is a picture of it finished. And the biggest unfinished project of the year? 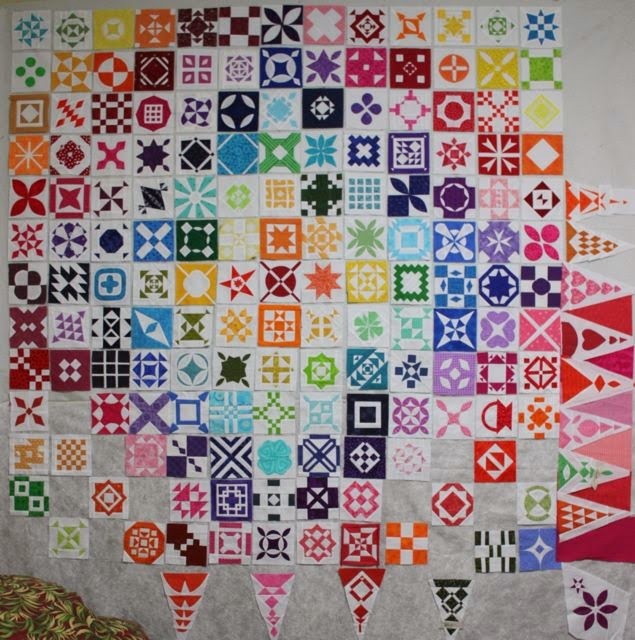 I made 177 out of 225 Dear Jane blocks. Just 48 blocks left to go. Most of them triangles. Guess what I'll be doing in the new year? Hand quilting my way home. Traffic is heavy, I might get a lot done! 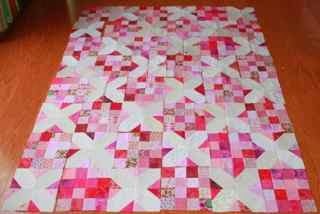 I think this will be my last finished quilt for 2013. I took the last stitches in the binding just in time to gift it to Phyllis who has been helping us to keep our house clean for quite a while. 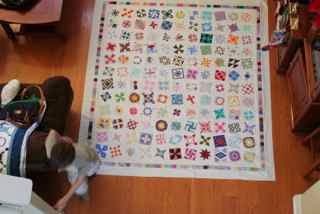 She has always taken an interest in my quilting projects, and while she was in one day last year she said jokingly, when am I going to get me quilt? Her favorite color is green, and I chose the Crossroads pattern which I have been seeing so many of around blogland. 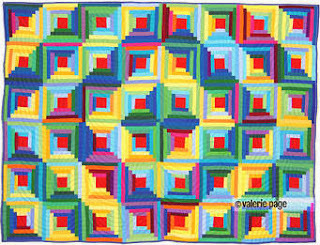 I found a wonderful tutorial for the block in three sizes at Connie's blog, freemotion by the River. It came together very quickly and used up almost all the green I had on hand. I seem to make a lot of quilts with green, maybe I'd better replenish my supply? I really liked this pattern and would love to try it in a smaller size. I think it would be even prettier if each link was either a consistent or a different color so that the pattern were easier to see. 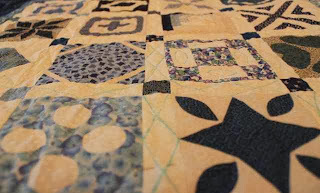 The quilting was a maze pattern which works just like meander, but with straight lines. I will definitely be using this pattern again. 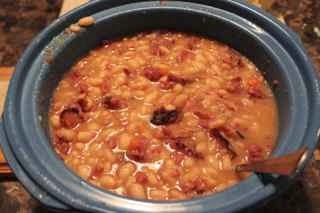 Dinner was ham and beans. Delish! There was a ham bone from our Thanksgiving ham that had been saved in the freezer for just such an occasion. I used a crockpot recipe that I found here. Last ScrapHappy Saturday of 2013! What a long strange year it has been. 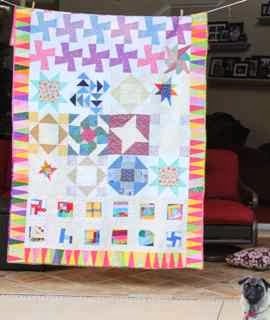 So many of you have sewed up lots of rainbow colored scrap blocks and some have even turned them into quilts. 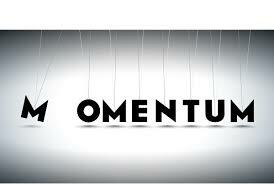 2014 promises to be a new chance to control the scraps and turn them into beautiful and functional finished projects. Next Saturday will be all about starting the year off with a huge color in most peoples scrap basket -- blue. Trying to stay away from the aqua and the lighter shades we will all start the year off with bright blue. For now though, are you still fnishing off for 2013? Feel free to post your last of the old year projects. If you are looking ahead to the new year, we would all love to see what you have planned for the Rainbow Scrap Challenge 204. Just add a link to your post below so we can all see what you have in the works. If you can include a link back to this blog that would even be better. If you are participating in Scraphappy Saturday, enter your name and URL in the form below and press Next to add your thumbnail. Click here to add your thumbnail if the pop-up does not appear. Learn more about Scraphappy Saturday here. 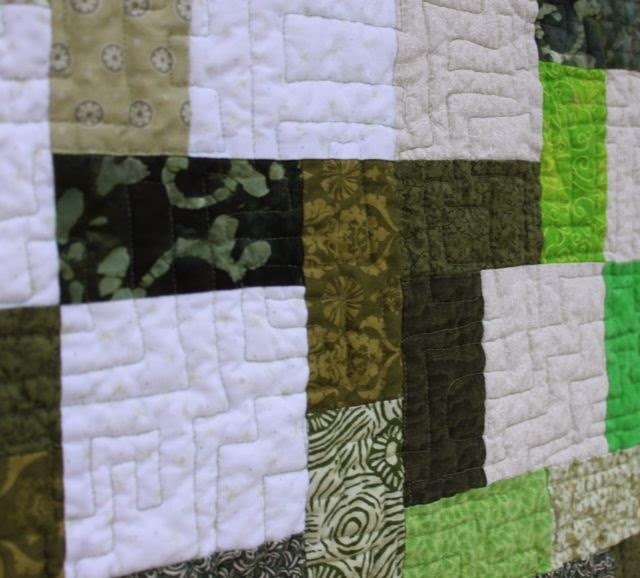 This quilt was born out of stack of orphan blocks. You know the ones -- they were practice, test blocks, extras or mistakes. Anna helped me puzzle them together this summer and even practiced some quilting when it was on the frame. I used the white space to practice some free motion filler stitches. This one is called a crybaby meander. I have seen it done beautifully. Mine just seems messy. This is a small meander. Easy enough. 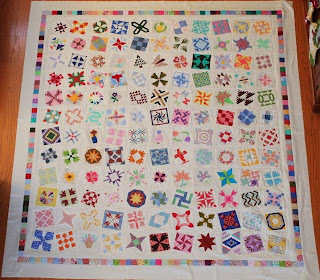 I'm thinking of this for the Midget blocks quilt. I think this one is called brain coral or something similar. Pebbling is fun, but also time intensive and stiff. 7 hours of handquilting in the car. Just 13 blocks left to do. 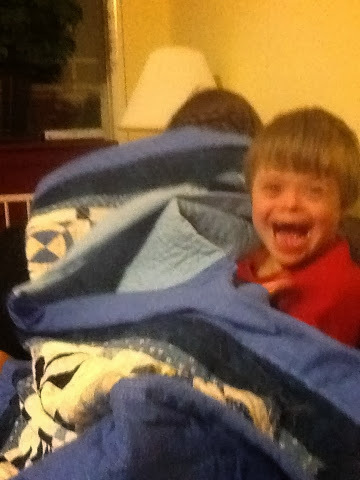 For now though, Zac thinks peekaboo is a better idea. This one was finished a little bit ago, but I never hung it up for a photo. 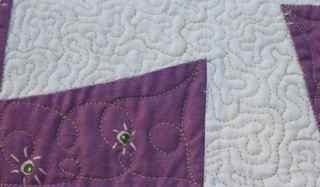 I was going through making a list of finished quilts for the year and didn't find many. I dug a little deeper though and started adding to the list. 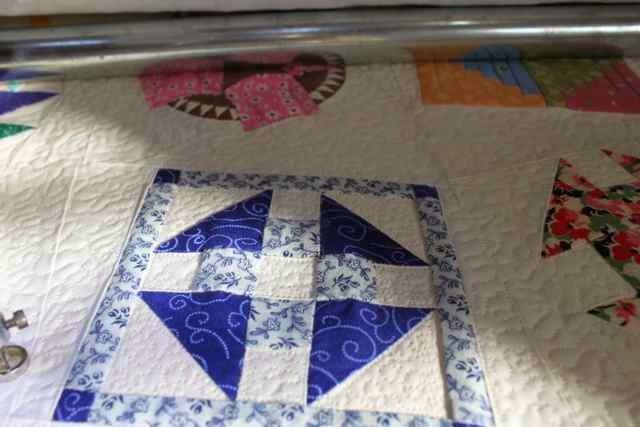 This poor little quilt sat on the quilting frame for months. I'm glad it is done. I've updated my pages to change the Rainbow Scrap Challenge 2013 to the Rainbow Scrap Challenge 2014. The basics remain the same, but I've had questions from new joiners and wanted to put it all together in one spot. Questions? Let me know. Welcome to the Rainbow Scrap Challenge for 2014. After three years full of scraps in all the colors of the rainbow, we still haven't managed to use them all up! The idea of the Rainbow Scrap Challenge is simple. Each month I will choose a new color. You just need to dig out some scraps in that color and make something -- anything. Definitions of scraps are as varied as the people who create them. Some people have a system for cutting scraps into useable sizes after every project, some toss everything into a bin and have to dig, some just sort them by color to keep their options opent. The choice is entirely yours. Most people seem to choose a focus project (or two or three) to keep them busy throughout the year. 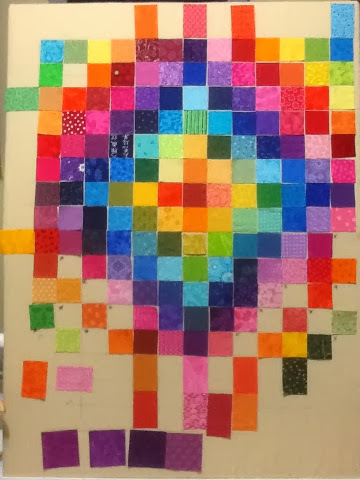 By completing one or more blocks in each color, they have a nice collection for a rainbow colored quilt at the end of the year. Others make smaller project along the way. 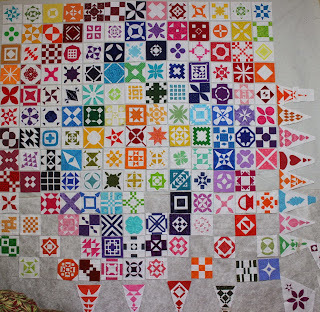 Some people have even more scraps to use up and make entire quilts in the color of the month! Again, the choice is up to you. I've started a board on Pinterest to collect some ideas to share. I'm pretty new to Pinterest, but I think there is a way others can post to the same board? Anyone know how that works? Each Saturday a Scraphappy link up will be posted so that you can see what everyone else is up to and collect some new scrap busting ideas. No need to sign up, no reason to feel bad if life gets in the way and you miss a month along the way. 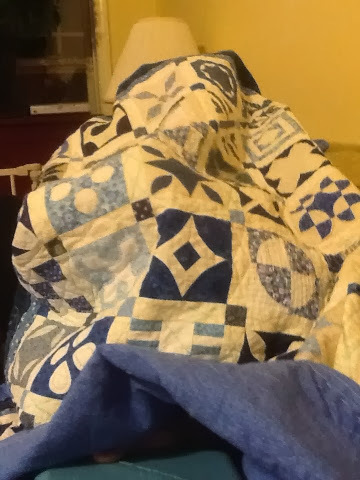 No quilt guilt allowed. 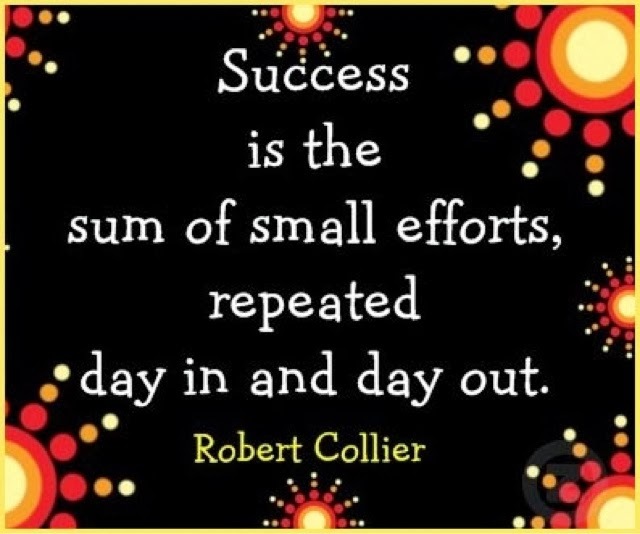 Just pop in on the weekend and check out everyone's progress, go visit others and offer some encouragement. This year as an extra special treat, we have a sponsor for the first time ever! 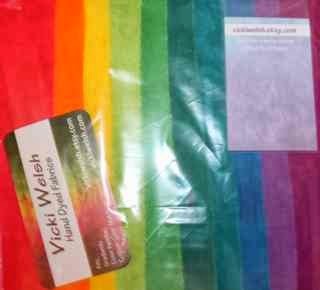 Vicki Welsh who blogs over at Field Trips in Fiber has sent me a breathtaking selection of her very own hand dyed fabrics. Each month I will be giving away a fabric collection to one randomly selected rainbow scrapper. The announcement will be just before the end of each month with the giveaway ending a week later. If you aren't lucky enough to win, don't feel too bad, Vicki has lots of beautiful fabric for sale for the rest of us. Check out her etsy shop to be inspired by all the colors of the rainbow. Her buttons are posted in my sidebar and they will take you directly there. Feel free to grab my button and post it on your blog. You should be able to just copy the HTML code in the box under the picture and paste it into a new gadget on your blog. Christmas Morning has left everyone tuckered out. It was a fun filled morning of gifts and family games. By afternoon everyone was ready for a bit of quiet time. Even Lizzie. The boys built with Robots while Anna made more cookies and Sydney found some friends. That left me a bit of time to quilt a bit more. Three rows done! I tried some outlining. Not perfect, but I think it will work. I even got out the ruler base and did some stitching in the ditch. I am getting better with each block. Slow and steady takes the prize. 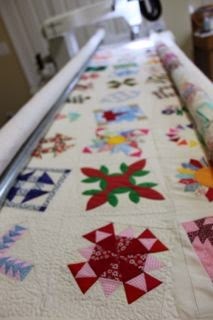 I hope you are all enjoying lots of quality holiday fun, any new quilting toys out there? Merry Christmas to everyone. Best wishes for a happy and safe holiday season for you and your families. Santa brought me a quarter inch foot for my backup sewing machine. Nothing can stop me now! We have just opened Christmas eve presents (new PJs of course). Finished listening to this version of the night before Christmas and sent the kids off to bed. They are pretty excited. 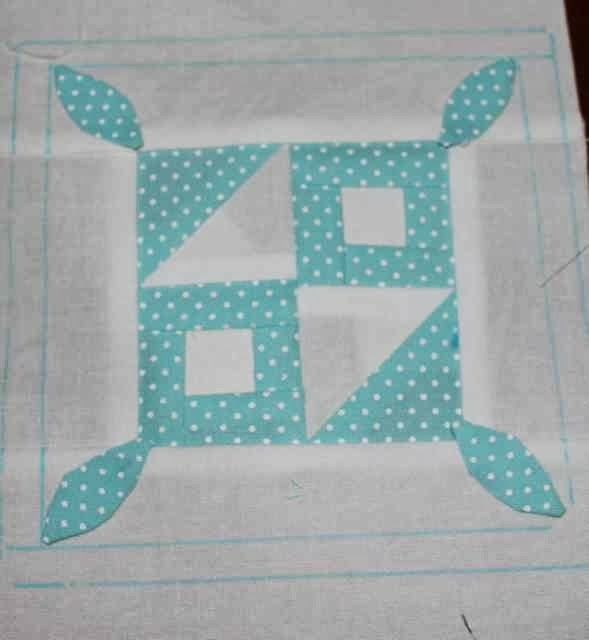 I am absolutely terrified of messing up my Midget Block quilt with the machine quilting part, but I am giving it a shot. 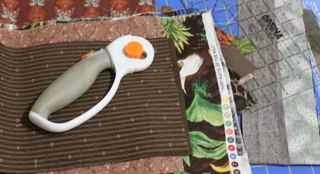 I keep comparing myself to fabulous machine quilters whose work I drool over on a regular basis. 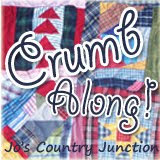 There is Judi over at Greenfairy Quilts. 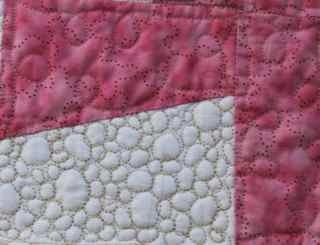 Then there is Leah Day at Free Motion Quilting. Even Natalia and Kathleen at Piece and Quilt. 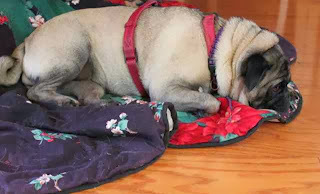 Guess what, my quilt won't look that good. They are professionals and I am just a regular person. I'm OK with that. 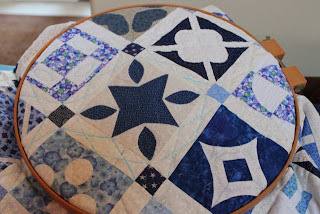 Still, I a sitting here hoping I don't mess things up with the quilting. So, two blocks in, going slow, and hoping for the best. I'm doing a small meander, you might even call it a stipple, in the background. Trying not to do too much in the blocks themselves. 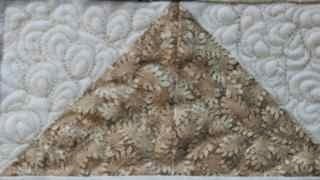 Just a bit of echo quilting to add a bit of dimension. So two blocks down, Just 119 left to go. 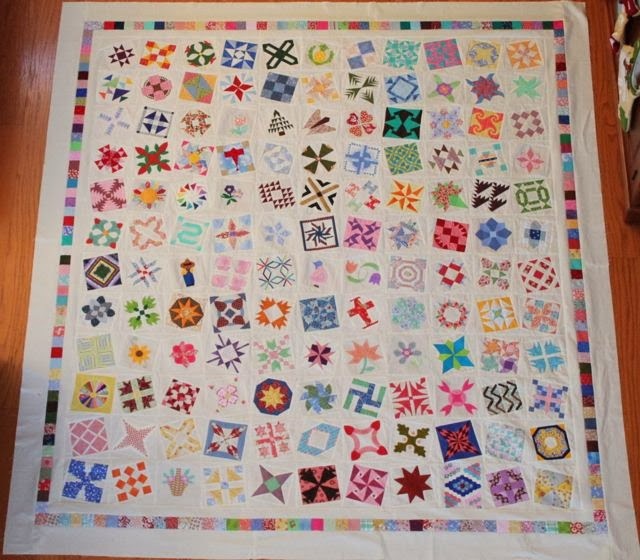 I just finished putting the borders on the Midget Block Quilt!!!!!!! 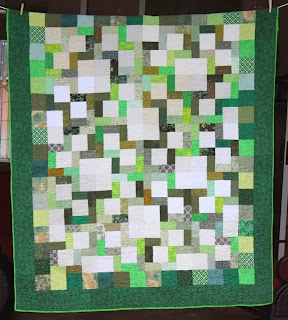 Hard to believe it took me almost a year to figure out 2 inch squares and background strips. It measures 80 by 86 inches now, which seems like a nice size. I'm not telling you because you need to know, I'm telling myself because I don't have anything that will work for a backing. I'm going to load the top on the frame anyway though, before it gets wrinkled, and I'll want to know later how big to make the backing fabric. This one will be an experiment in machine quilting. The little Dear Jane tried to be machine quilted and failed. I'm hoping this little guy will do better and then I will be up for the BIG Rainbow Jane. I laid the quilt out in the family room so that I could go up to the bridge on the second story to get a good photo. There is Ryan walking around the quilt and Kurt's Christmas stocking poking out on the other side. 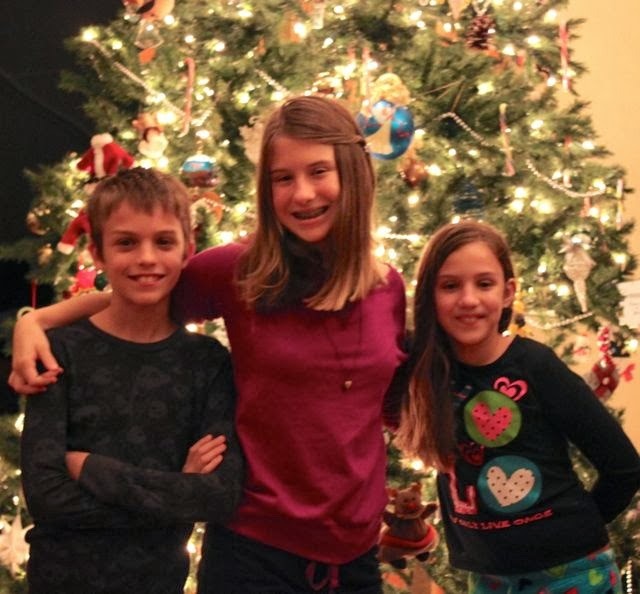 Getting decent pictures is complicated around here! 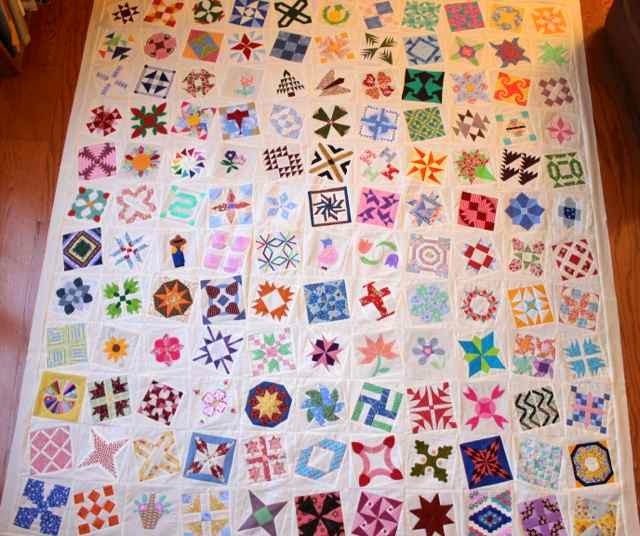 Speaking of complicated, the quilting room (guest bedroom) is getting a good clean out to make room for a bit of machine quilting time. I wonder if there is still time tonight to pop out for a suitable backing fabric? Maybe not. Today we celebrated the first official day of vacation with trips to the grocery store and the dentist. Exciting stuff, right? Nothing on the agenda for tomorrow though, other than Christmas eve of course. Maybe I'll be able to sneak away for another Dear Jane block or two? Maybe. I was making a list of finished quilts for the year. Try as I might, I still only came up with five full finished quilts for the year. Just 5? Could that be right. What have I been doing with my time? Then I remembered. These little guys have taken up a bit of my sewing time in the last year. Yup, worth every minute. It has been almost a year since I officially began working on Dear Jane. Just 11 more center blocks left to go! I'm still playing with the triangles. They might take a bit more time. There is a pink block on the top row that is bugging me, I might remake that one. In general though, I'm pretty happy with the way things are coming together so far. It was so odd waking up on a Monday and not going to work. I could get used to this. This top has been sewn together and waiting patiently for almost a year. I was sure I would get to it this summer. I almost did. The summer went another way though, and when the school year started, well, that was that. I wasn't quite sure what to do with the borders. I'm never sure what to do with the borders. During the sewing, I had saved a two inch square of each fabric and that was supposed to be part of it somehow. I kept trying to make it complicated though and time passed. 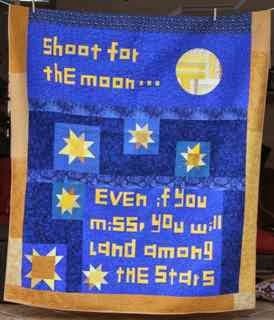 While catching up on blogs during ScrapHappy Saturday, I stumbled upon this quilt, over at Quilting on the Crescent. Perfect. Just the inspiration I needed! I just finished adding a two inch border of background all the way around and am sewing together all of the two inch squares. 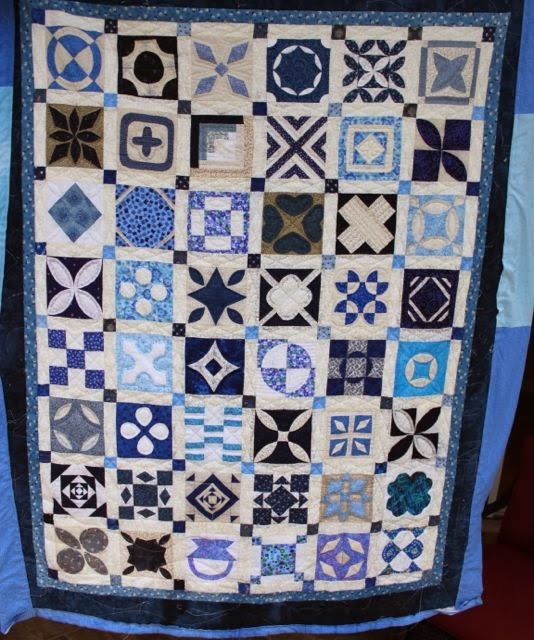 I'll add another plain border outside that and it will be just what this quilt needs. 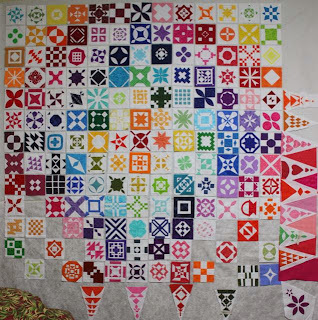 After trimming up all the Rainbow Janes so far and getting them up on the wall yesterday, I noticed that a few of the melons and star points extended into the seam allowance. Not wanting the same thing to happen again, I marked the cutting line and sewing line before placing the melons on this little guy. He is J8 and is called Anna's Anchor. Sewing down the little melons sound like a great way to spend a few minutes today. 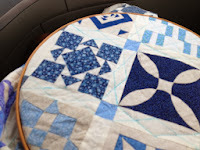 I've been chipping away at the hand quilting on the blue Dear Jane this week. Just 22 more blocks remain of the 48 in this very small Baby Jane. I'm thinking a nice rope will look good for the border. Are you planning a few quiet minutes of handwork during this hectic holiday season? 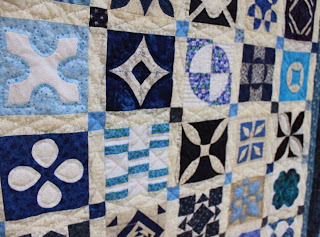 Head over to Kathy Quilts to see what other hand work is in the works. Having spent the morning climbing up and down a ladder to get my Dear Jane blocks up on the design wall, I am seriously pondering NOT doing the triangles. They are about 25% done, but I'm just not sure they are worth the effort. 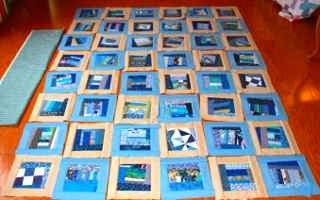 Not doing them would allow me to use a wider sashing for the blocks and spread them out a bit to give them some space to breath. A simpler border treatment might allow the center blocks to shine. Then again, maybe I am just feeling lazy and see a possible light at the end of the tunnel? If I skip the triangles, will I always feel that I cheated and took the easy way out? Opinions please. Triangles or no triangles? It is the first day of winter vacation and I have two weeks to officially sew myself silly! I have officially given up on getting my sewing machine back anytime soon and ordered a quarter inch foot for Anna's machine. It is a simplicity surplus school machine, but it makes a fine stitch. If I can just get the quarter inch seem working well I'll be good to go. So last night I dug through my brown scraps and found some pieces big enough to turn into two inch strips for the solstice step three. 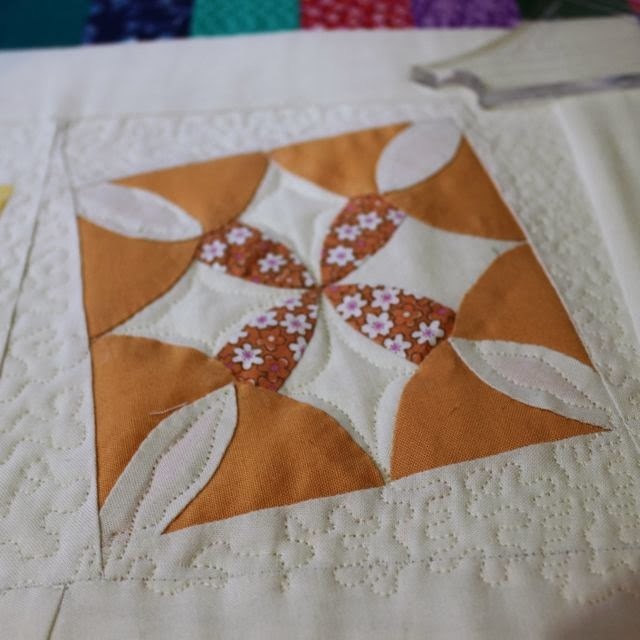 Bonnie's (Hunter) orange is my brown and I think I found plenty leftover from when I did her Smith Mountain quilt. Then I kept working on the crumb blocks for Bonny's (mother in law this time) anniversary quilt. 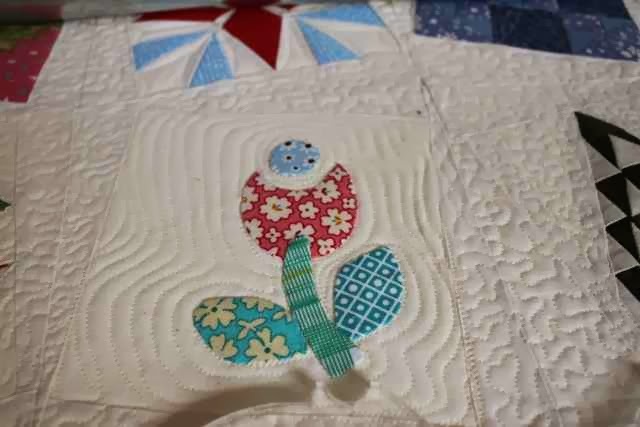 Then, after I was all tuckered out from that, I settled in to watch Sing-off with the girls while enjoying a bit of hand quilting on the blue Dear Jane. I am making nice progress after several evenings in a row. Consistency is the key to so many things. And her it is Saturday morning and I am ready to draw the lucky winner for this beautiful bundle of hand dyed fabric from Vicki Welsh at Field Trips in Fiber. Drumroll please. Thanks to the random number generator at Random.org, the winner is.....Carla at A Few of My Favorite things. Congratulations Carla. Please send me your snail mail via e-mail and I will hop off to the post office to send out your rainbow fabric bundle. I do think they will make your pickle dish blocks sparkle. 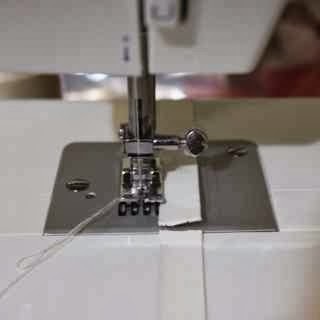 Happy sewing. After all of that, I almost forgot to post a link-up for ScrapHappy Saturday. Lots of finishing up is happening about now. I hope you are finding a few minutes of peace and calm in this busy holiday season to enjoy the calm and quiet of a bit of fabric and thread. Use misterlinky to share your progress or even plans for the new year. It is just around the corner! Just 13 more center blocks for Dear Jane. Not bad almost one year in. If I had a proper machine I could finish them off likety split. Last year I saw people choosing a word for the new year. What a nice way to simplify the idea of resolutions. I gave it a lot of thought and finally decided on perseverance for myself. I knew the new schedule at work would be trying and cause a big shift in how I had to do things. It has done that and more, but I have gotten through it without too many upsets. 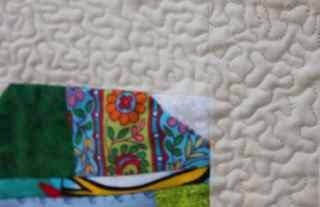 So as the next year starts I was thinking of a new word while doing a little hand quilting on Jane. I went looking for some decorative word art and found this quote that spoke to me. I will still search for the right word, but this thought will stay with me. It isn't too late to join the giveaway. Two more days until the winner is drawn. Just follow the hyperlink and leave me a comment. I will draw first thing on Saturday.